Today has been a day of practice for me. I took my first trip to the range in too long and then I took advantage of the lengthening days to get out after dinner. We all love just getting out on the course and playing. But, getting the maximum enjoyment out of our golf needs a certain level of performance. If you are just hacking your way around the course, shanking left right and centre and notching up a cricket score, you’re not going to enjoy the game much. On Saturday I played a round for the first time in many weeks and I sucked – hard. I didn’t hit many good full swing shots and seemed completely incapable of hitting the ball properly with my driver. A short window of opportunity opened up this afternoon and I hopped in the car for the 5 minute trip to my local range. My biggest issue with my game right now is the major slice on my driver and longer clubs. When you see my swing it is clear why this is happening – I am swinging the club on a distinct out to in plane. I seem to be able to get away with it with medium/ short clubs but it really hurts me with the longest club in the bag. Without the benefits of pro lessons (on my wishlist…). I have done some research and it seems perhaps that I am not rotating my core enough. To try and address this I am attempting to rotate in my swing more – so that the clubface follows a semi circular, more in to out, path. Hopefully I’m not doing the completely wrong thing – I shall find out in due course I guess but so far it does seem like it helps. I am also working on my rhythm – more than one other golfer has told me that I swing “far too quickly”. Of course in line with all the conflicting advice out there I have also been told that everyone has a natural speed and to try and alter it is deadly. In his excellent instructional video Lessons of a Lifetime, Tom Watson talks about swinging the club to the timing of saying “edelweiss”. This was what I was trying to do today and it again it seemed to be a decent plan of attack. Anyway, what this meant was that I wanted to hit balls full swing at the range to try and incorporate these tweaks. I have been told before that the best club to use extensively at the range is the 7 iron – because it doesn’t require much alteration to hit a shorter or longer club. Indeed, I watched a short “guide to” on the BBC website earlier and Rory McIlroy states that he hits the majority of his practice/ range shots with a 6 iron as it is “not a long club or a short club”. While I did hit a handful of driver. hybrid and short irons, out of the fifty balls I hit probably about 75% of them were my 7 iron. 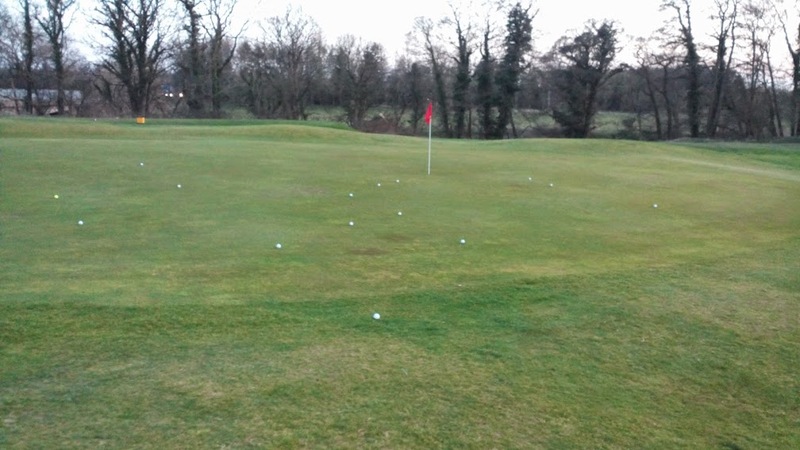 I was reasonably satisfied with the session as I felt that I was hitting better at the end than I had been at the start – surely that is the objective of practice?! Since the clocks moved forward last weekend, the evenings have noticeably become longer. 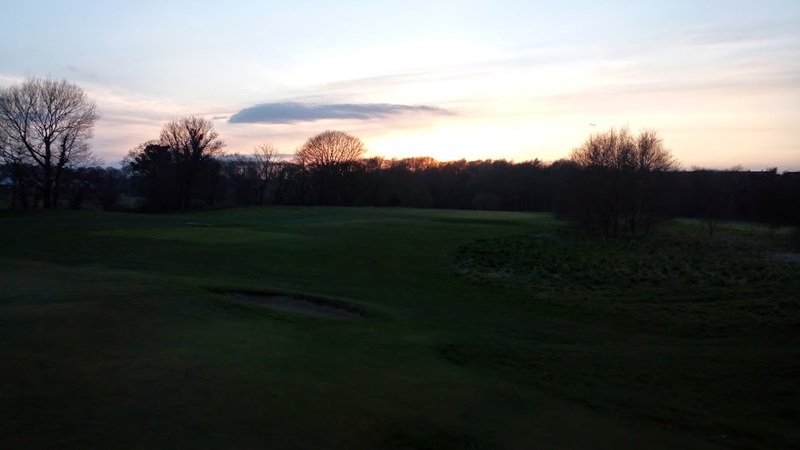 Last night I reckoned sunset was after 8 o clock so tonight I took the opportunity to nip down to my local course for a quick half an hour after my daughter had gone to bed and before darkness fell. The light seemed to be lasting so I thought I would play a couple of holes. I teed off from the 5th – the tee box you can see in the background of the photo above – and it wasn’t a slice! OK, it was a serious fade but it was slightly less right bound than I have hitting the past eight months or so. Unfortunately the gloaming was upon me and I couldn’t find my ball in the gloom. So, have today’s activities made me a better golfer? Not yet I think. But, with the boon of Scottish summer evenings I aim to repeat what I have done today on as regular a basis as the rest of my life will allow over the coming months. Then, I think I will see some benefit. Today at the range I paid for 100 balls as it works out a better deal. At this range they use tokens which resemble coins for the ball machine – one token dispenses 50 balls. So, I received two tokens when I paid my money but I only hit 50 balls. I will go again later this week to hit the other 50. I really believe that is a better approach than hitting loads in one sitting. I used to give the same advice to my students when I taught English – better to come to class twice a week and take one lesson each time then just come once and do a double. This entry was posted in Mental game, Technique and tagged Technique. Bookmark the permalink. 1 Response to Practice makes…?